Role-Based Access Control (RBAC) for certain services with advanced access controls to data. Role-based access control with Apache Sentry.As of Cloudera Manager 5.1.x, Sentry permissions can be configured using either policy files or the database-backed Sentry service. The Sentry service is the preferred way to set up Sentry permissions. See The Sentry Service for more information. For the policy file approach to configuring Sentry, see Sentry Policy File Authorization. Important: Cloudera does not support Apache Ranger or Hive's native authorization frameworks for configuring access control in Hive. Use Cloudera-supported Apache Sentry instead. The majority of services within the Hadoop ecosystem, from client applications like the CLI shell to tools written to use the Hadoop API, directly access data stored within HDFS. HDFS uses POSIX-style permissions for directories and files; each directory and file is assigned a single owner and group. Each assignment has a basic set of permissions available; file permissions are simply read, write, and execute, and directories have an additional permission to determine access to child directories. Ownership and group membership for a given HDFS asset determines a user’s privileges. If a given user fails either of these criteria, they are denied access. For services that may attempt to access more than one file, such as MapReduce, Cloudera Search, and others, data access is determined separately for each file access attempt. File permissions in HDFS are managed by the NameNode. Hadoop also maintains general access controls for the services themselves in addition to the data within each service and in HDFS. Service access control lists (ACL) are typically defined within the global hadoop-policy.xml file and range from NameNode access to client-to-DataNode communication. In the context of MapReduce and YARN, user and group identifiers form the basis for determining permission for job submission or modification. In addition, with MapReduce and YARN, jobs can be submitted using queues controlled by a scheduler, which is one of the components comprising the resource management capabilities within the cluster. Administrators define permissions to individual queues using ACLs. ACLs can also be defined on a job-by-job basis. Like HDFS permissions, local user accounts and groups must exist on each executing server, otherwise the queues will be unusable except by superuser accounts. Apache HBase also uses ACLs for data-level authorization. HBase ACLs authorize various operations (READ, WRITE, CREATE, ADMIN) by column, column family, and column family qualifier. HBase ACLs are granted and revoked to both users and groups. Local user accounts are required for proper authorization, similar to HDFS permissions. Apache ZooKeeper also maintains ACLs to the information stored within the DataNodes of a ZooKeeper data tree. For finer-grained access to data accessible using schema -- that is, data structures described by the Apache Hive Metastore and used by computing engines like Hive and Impala, as well as collections and indices within Cloudera Search -- CDH supports Apache Sentry , which offers a role-based privilege model for this data and its given schema. Apache Sentry is a granular, role-based authorization module for Hadoop. Sentry provides the ability to control and enforce precise levels of privileges on data for authenticated users and applications on a Hadoop cluster. Sentry currently works out of the box with Apache Hive, Hive Metastore/HCatalog, Apache Solr, Cloudera Impala and HDFS (limited to Hive table data). This is a data processing application such as Hive or Impala that needs to authorize access to data or metadata resources. The data engine loads the Sentry plugin and all client requests for accessing resources are intercepted and routed to the Sentry plugin for validation. Authorization models - Defines the objects to be subject to authorization rules and the granularity of actions allowed. For example, in the SQL model, the objects can be databases or tables, and the actions are SELECT, INSERT, and CREATE. For the Search model, the objects are indexes, collections and documents; the access modes are query and update. Sentry relies on underlying authentication systems such as Kerberos or LDAP to identify the user. It also uses the group mapping mechanism configured in Hadoop to ensure that Sentry sees the same group mapping as other components of the Hadoop ecosystem. Consider users Alice and Bob who belong to an Active Directory (AD) group called finance-department. Bob also belongs to a group called finance-managers. In Sentry, you first create roles and then grant privileges to these roles. For example, you can create a role called Analyst and grant SELECT on tables Customer and Sales to this role. Role-based access control (RBAC) is a powerful mechanism to manage authorization for a large set of users and data objects in a typical enterprise. New data objects get added or removed, users join, move, or leave organisations all the time. RBAC makes managing this a lot easier. Hence, as an extension of the discussed previously, if Carol joins the Finance Department, all you need to do is add her to the finance-department group in AD. This will give Carol access to data from the Sales and Customer tables. As illustrated above, Apache Sentry works with multiple Hadoop components. At the heart you have the Sentry Server which stores authorization metadata and provides APIs for tools to retrieve and modify this metadata securely. Note that the Sentry Server only facilitates the metadata. The actual authorization decision is made by a policy engine which runs in data processing applications such as Hive or Impala. Each component loads the Sentry plugin which includes the service client for dealing with the Sentry service and the policy engine to validate the authorization request. Hive works with both, the Sentry service and policy files. Cloudera recommends you use the Sentry service which makes it easier to manage user privileges. For more details and instructions, see The Sentry Service or Sentry Policy File Authorization. The NameNode loads a Sentry plugin that caches Sentry privileges as well Hive metadata. This helps HDFS to keep file permissions and Hive tables privileges in sync. The Sentry plugin periodically polls the Sentry and Metastore to keep the metadata changes in sync. Sentry can apply a range of restrictions to various Search tasks, such accessing data or creating collections. These restrictions are consistently applied, regardless of the way users attempt to complete actions. For example, restricting access to data in a collection restricts that access whether queries come from the command line, from a browser, or through the admin console. With Search, Sentry stores its privilege policies in a policy file (for example, sentry-provider.ini) which is stored in an HDFS location such as hdfs://ha-nn-uri/user/solr/sentry/sentry-provider.ini. Sentry with Search does not support multiple policy files for multiple databases. However, you must use a separate policy file for each Sentry-enabled service. For example, Hive and Search were using policy file authorization, using a combined Hive and Search policy file would result in an invalid configuration and failed authorization on both services. Note: While Hive and Impala are compatible with the database-backed Sentry service, Search still uses Sentry’s policy file authorization. Note that it is possible for a single cluster to use both, the Sentry service (for Hive and Impala as described above) and Sentry policy files (for Solr). Like many distributed systems, Hadoop projects and workloads often consist of a collection of processes working in concert. In some instances, the initial user process conducts authorization throughout the entirety of the workload or job’s lifecycle. But for processes that spawn additional processes, authorization can pose challenges. In this case, the spawned processes are set to execute as if they were the authenticated user, that is, setuid, and thus only have the privileges of that user. The overarching system requires a mapping to the authenticated principal and the user account must exist on the local host system for the setuid to succeed. Cloudera strongly recommends against using Hadoop's LdapGroupsMapping provider. LdapGroupsMapping should only be used in cases where OS-level integration is not possible. Production clusters require an identity provider that works well with all applications, not just Hadoop. Hence, often the preferred mechanism is to use tools such as SSSD, VAS or Centrify to replicate LDAP groups. Cloudera does not support the use of Winbind in production environments. Winbind uses an inefficient approach to user/group mapping, which may lead to low performance or cluster failures as the size of the cluster, and the number of users and groups increases. Irrespective of the mechanism used, user/group mappings must be applied consistently across all cluster hosts for ease with maintenance. System and Service Authorization - Several Hadoop services are limited to inter-service interactions and are not intended for end-user access. These services do support authentication to protect against unauthorized or malicious users. However, any user or, more typically, another service that has login credentials and can authenticate to the service is authorized to perform all actions allowed by the target service. Examples include ZooKeeper, which is used by internal systems such as YARN, Cloudera Search, and HBase, and Flume, which is configured directly by Hadoop administrators and thus offers no user controls. The authenticated Kerberos principals for these “system” services are checked each time they access other services such as HDFS, HBase, and MapReduce, and therefore must be authorized to use those resources. Thus, the fact that Flume does not have an explicit authorization model does not imply that Flume has unrestricted access to HDFS and other services; the Flume service principals still must be authorized for specific locations of the HDFS file system. Hadoop administrators can establish separate system users for a services such as Flume to segment and impose access rights to only the parts of the file system for a specific Flume application. 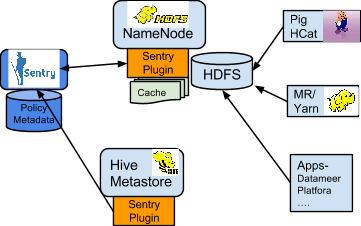 * Sentry HDFS plug-in; when enabled, Sentry enforces its own access permissions over files that are part of tables defined in the Hive Metastore.